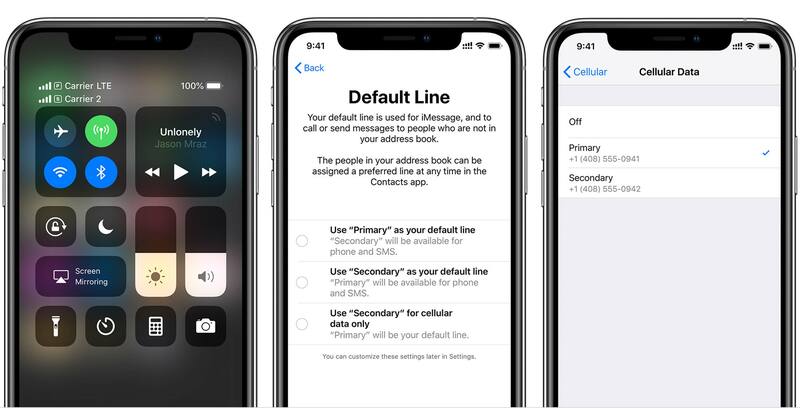 In a recently published support document, Apple has outlined precisely how dual SIM support is set to work with the iPhone XS and iPhone XS Max. The page explained how to setup dual sims and indicates when the feature is set to be available. While dual SIM support won’t be available when the iPhone XS launches on September 21, it’s coming to iOS 12 later this year, says Apple. That said, a specific release date has not been revealed. To use the dual sim feature, the iPhone XS or XS Max must be unlocked, which won’t be an issue in Canada for most users, or the same carrier as the first SIM. In the Canadian market Bell plans to support eSIM technology with the iPhone XS and XS Max. While Rogers has stated in the past that the carrier plans to support https://mobilesyrup.com/2018/01/02/rogers-confirms-plans-support-esims-year/eSIM technology by the end of 2018, the company has not made an announcement yet regarding the iPhone XS. Further, it looks like both SIM cards can be eSIMs, with the Chinese market being the exception to this rule. While the feature hasn’t launched yet, in other to add an eSIM to the iPhone XS, you first need to navigate to ‘Settings’ and then ‘Cellular.’ Next, tap ‘Add Cellular Plan.’ You can then use your iPhone to scan a carrier-provided QR code. Apple has also said that Group FaceTime is set to be added to iOS 12 at some point in the future. You can find Apple’s full document on eSIM usage with the iPhone XS and XS at this link.